Sous vide can initially be an intimidating type of cooking and conceptually it can be very difficult because of its differences with traditional cooking. The various types of sous vide equipment, questions about vacuum sealing, and the science of the safety of sous vide can all play a part in confusing new cooks. However, once you understand a few basics, sous vide cooking is one of the easiest and most foolproof ways to cook. In this article I'll give you the foundation you need to get started with sous vide including the basic process, the important safety information, and recommended setups you can use. So let's get started! The actual process of cooking sous vide is very simple. You determine the temperature you'd like to cook your food to, say 131°F (55°C) for a medium-rare steak. Then you heat some water up to that temperature. You seal your food in a vacuum bag or Ziploc bag and place it in the water until the food comes up to the temperature of the water. 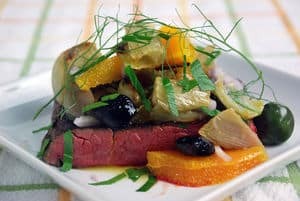 For foods that aren't tender (think pot roasts, short ribs, briskets, etc) you can continue cooking it once it comes up to temperature until the food has been tenderized (sometimes up to 2 or 3 days!). Then just finish your food with a sear and you're all set! I'd like to invite you to join my FREE Sous Vide Quick Start email course. It will help you make perfect meats, master searing, and discover the sous vide times and temperatures you need to make everyday food amazing...and impress your friends and family.